The Statler Brothers lyrics are a collection of some of the best songs ever by a quartet, and their awards verify that. These guys had a long and very successful career, Jimmy Fortune is still performing. Grab your old guitar and enjoy playing some of these classics. 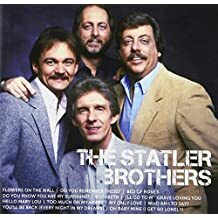 The Statler Brothers are one, if not the most successful vocal harmony groups in the history of country music. They were formed in 1955 by bass vocalist Harold Reid, baritone Phil Balsley and tenor Lew Dewitt. They performed gospel music under the name of the Kingsmen. It wasn’t until 1960 that Harold’s younger brother joined the group as the lead singer. The Statler Brothers are entertainers, they have a unique talent of captivating a crowd with their songs and their humor. Jimmy Fortune wrote some of the prettiest love songs every recorded, for example “Forever”, “Elizabeth” and “My Only Love”.